Alberto Campo Baeza is a professor at the Madrid School of Architecture, ETSAM, where he has been a tenured professor for more than 25 years. He has taught at the ETH in Zurich and the EPFL in Lausanne as well as the University of Pennsylvania in Philadelphia. And in Dublin and Naples, Virginia and Copenhagen. And at the Bauhaus in Weimar and at Kansas State University. He spent a year as a research fellow at Columbia University in New York in 2001 and again in 2011. He has given many lectures and has received many awards like the TORROJA for his Caja Granada building. 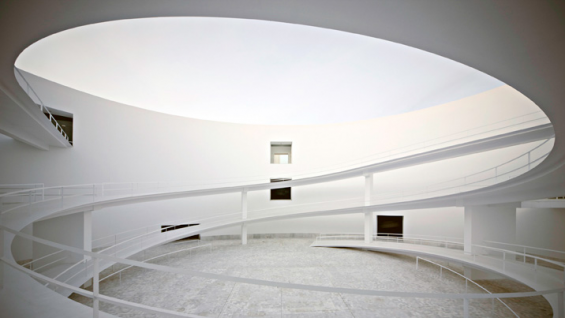 And he was awarded the Buenos Aires Biennial 2009 for his Nursery for Benetton in Venice and his MA Museum in Granada. He has recently been nominated by the American Academy of Arts and Letters for the prestigious Arnold W. Brunner Memorial Prize of 2010.